NFPA member Cameron Naficy’s fire research got some ink in the Hungry Horse News . . . Following a 2017 fire season that saw significant burning in Glacier and Waterton parks, with Kenow and Sprague wildfires, scientists and researchers have been hard at work determining what the fires mean for both parks as another fire season starts cooking. Fire ecology was the subject of a presentation by the University of Columbia’s Cameron Naficy recently at Science and History Day in Waterton. According to Naficy, recent wildfire studies have changed the scientific community’s understanding of how fire affects the Glacier and Waterton region. Wildfire plays an important and integral role in our forested ecosystems. Local fire history records show that our forests have evolved with fire for thousands of years. We have successfully suppressed 98% of wildfires in the greater Flathead Area since approximately 1930, and the resulting accumulation of fuel creates an environment conducive to large fire growth. It’s important for our community to understand wildfire and promote a proactive approach to mitigating impacts to our communities; private property, airshed, watersheds and forest ecosystems. 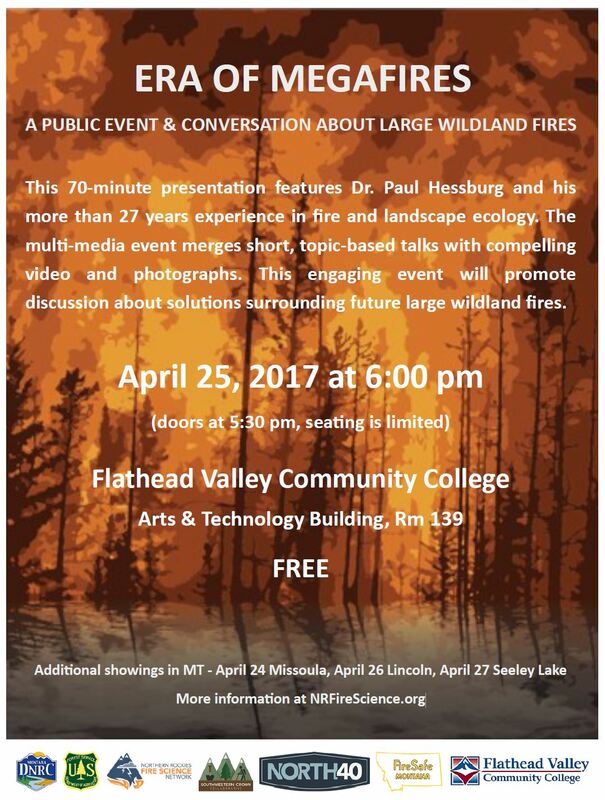 On April 25th, the community is invited to a public event and conversation at the Flathead Valley Community College, Arts and Technology Building Room 139 at 6:00 p.m., for an “Era of Megafires” presentation. This 70-minute multi-media traveling presentation by Dr. Paul Hessburg, will help our community understand the issues surrounding Megafires, so collectively we can move toward solutions that can change the way we receive wildfire and related smoke. 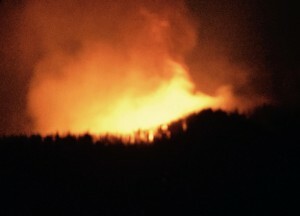 Dr. Hessburg has conducted fire and landscape ecology research for more than 27 years. The “Era of Megafires” presentation will be followed by a question and answer session around topics that are relevant to the community in order to identify local challenges and local actions. Typically, different communities face different obstacles when it comes to wildfire preparedness and resilience. The intent of this presentation is to significantly reduce the amount of loss we are experiencing by developing a collective understanding of fire, approaches to wildfire management, and how landowners can engage. The “Era of Megafires” is brought to you by Flathead Area FireSafe Council, Northern Rockies Fire Science Network; Southwestern Crown Collaborative, Montana DNRC/Kalispell Unit; Flathead National Forest, Flathead Valley Community College and FireSafe Montana. For more information, contact Mike West, Flathead National Forest at 758-3939, or Ali Ulwelling, MT DNRC at 751-2270.